We were at our Maplewood Bog MAPS station today. This is our second year running it, so we’ve already got one season under our belts. Although the exact dates that we’re visiting this year differ from last, the protocol for operations states that we must make seven visits approximately evenly spaced between last week of May and first week of August, so we do still get to see the site across the season. So it was with a bit of surprise that I noticed on this visit some wildflowers that I hadn’t seen there before, either this year or last. The discovery of new-to-me species wouldn’t be too noteworthy in and of itself, except for the fact that these were right beside the path. I mean right beside, like I could have stepped on them right beside. How had I missed them? Could they possibly have been present last summer and I’d just overlooked them? Perhaps part of the reason I might not have noticed is that they’re pretty small. Each flower is tiny, just a few millimeters wide. The stem itself is a little taller, but few were more than a foot/30 cm. I thought I recognized that spiraling pattern of the flowers, either from browsing field guides or from some online research I’d done at some point. I had a suspicion that the plant was an orchid, but it was only confirmed when I returned with my camera and was able to get a photo of the flowers I could zoom in on (being close to the ground as they were and not wanting to cut any, it was tricky to see closely otherwise). They have that full lower lip and the two thin side petals that I tend to associate with orchids. The exact identity remained a mystery until I got home; I couldn’t even remember the common name of the group of orchids it belonged to. 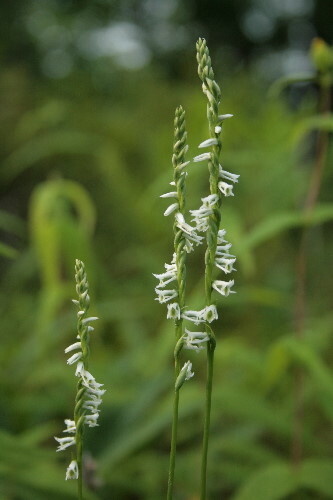 However, the answer was easily found: these are Slender Ladies’-tresses, Spiranthes lacera. This is one of the more common of the five species of Spiranthes that have been recorded in Lanark county (where our home is; Maplewood Bog is actually in Frontenac county, but they’re close enough that much of the flora is shared, and I only have a detailed checklist for Lanark). 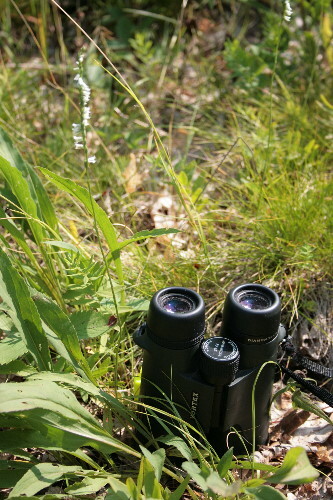 The Frontenac Provincial Park species checklist only lists four ladies’-tresses. They are much smaller than I thought ladies’-tresses were, and if they didn’t have that spiraling pattern I might not have clued in. Slender Ladies’-tresses are the easiest to identify because, as their name implies, they have a very slender flower stem compared to the others. 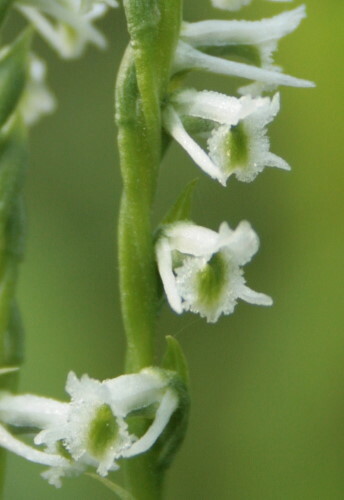 The “ladies’ tresses” part supposedly comes from the fact that the flower formations resemble the braids of long-haired women (particularly in some other species where there are double-spirals, instead of the single spiral as seen here). The Lanark checklist specifies that the species is found in dry, rocky meadows, and the spot at Maplewood sure fits the bill. The flower in July and August, and the leaves, present in the spring as a basal rosette, wither before the flowers open. Apparently they have a sweet scent, but I didn’t try sniffing them. It is interesting to note that in that first photo, at the top, two of the stems spiral clockwise while the third spirals counterclockwise. I gather that this is a genetic difference akin to the right- or left-handedness of people. The flowers themselves grow with the thick lower lip at the top, and perform a 180-degree twist prior to opening so that the lip will be presented at the bottom of the flower (this is a characteristic true of most orchids; if you own potted indoor orchids, try watching the flower buds as they open). Beautiful! I’ll bet you didn’t find them last year because they weren’t blooming yet. Whereas this year, everything seems to be blooming about two weeks ahead of normal. Ladies’-tresses are among my favorite orchids. Thank you for this labor of love. Gorgeous blog, so glad I found you! I’ll be back!